Just a short share this morning regarding an amazing project undertaken by The British National Trust (Two years ago; I’m late on this, but it’s just so cool!) to restore a gorgeous green gown worn by Ellen Terry while playing Lady Macbeth at London’s Lyceum Theatre in 1888! Ellen Terry as Lady Macbeth wearing the dress in 1888! According to this article, the gown cost £50,000 to restore (about $80,400), money which was specifically raised for the project! (Hooray for people who want to actually RESTORE things!) The project took approximately 1,300 hours over the course of two years to complete. (It was finished in 2011, apparently.) Most of the labor involved strengthening the fabric, which in addition to being more than 100 years old, had been altered multiple times, weakening the fibers. Many of the original jewel beetle wings had been collected over the years, and were re-attached, along with some 1,000 newly donated for the project! Restoration specialists style the dress for display. 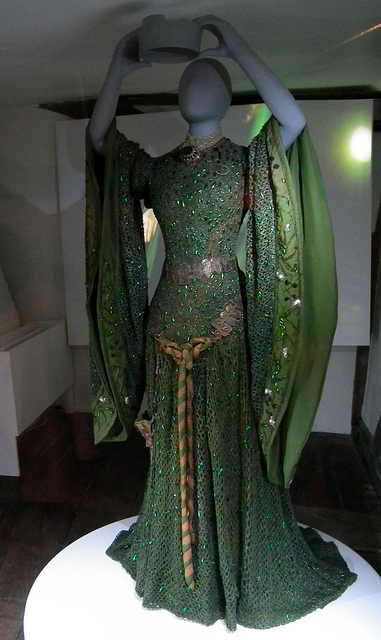 This iconic dress is on rotating display at Smallhythe Place, Kent. In addition to being a piece of historic, theatrical art itself, the gown was immortalized in a John Singer Sargent portrait, on view at the Tate Gallery. Here is the restored gown version in all it’s glory! The REAL dress in said Lady Macbeth pose! Apparently, Dame Ellen Terry was known (in addition to her incredible acting talent) for placing a high value on her costumes, and taking excellent care of them. Just one more reason why this project is so important; not only does it immortalize a beautiful piece of art, but also history, and the artist herself! Previous Post More Random Fun Because It’s Wednesday! Next Post Style Icon – Madeline Kahn! She was Sir John Gielgud’s aunt.